Winter in Greece are short. They sweep in late, starting to make their presence felt around mid October and into November, making it possible even to go swimming in December. January and February are the coldest months, and then by mid March, the first warm fingers of Spring start running their fingers through your hair. The streets are humming at the moment with the promise of new life and already the orange trees that line every street intermittently with olive trees are bursting with blooms. The result is gloriously sunshine soaked Spring mornings with the perpetual heady scent of orange blossom. There is an added buzz to this time of year. We are drawing ever closer to Easter in Greece. The start of Lent in Greece is marked with a variety of rituals, the first and most important being food. Since the start of Lent, or Clean Monday as it’s called here, is also considered the start of Spring, it’s tradition to cook a grand seafood-based meal and consume it with friends and family. Meat is not consumed in keeping with the tradition of Lent, whereby meat, dairy products and certain types of oils are not eaten for 40 days. It should be pointed out here that it is widely acknowledged that Greek Orthodox priests fancying a bit of steak have been known to publicly baptize pieces of meat as vegetables to get around the No Meat clause that their position of keepers of the religion requires. Baptisms are enormously important, life-defining occasions in Greek life. So if the priest says you are a cabbage when you are in fact a goat, you are a cabbage, no questions asked. Another tradition is to fly a kite. It is said that in doing so evil is dispelled and the Devil is kept away. I remember watching this for the first time after moving to Greece. Greek kites are traditionally hexagon shaped, with decent, first world nylon strings wound onto handy reels. I watched these kites take flight and dance in the air, happy children tugging merrily at the strings. It was so civilized and proper, almost jarringly peaceful compared to my own childhood memories of kite flying. I racked my brain for what was missing from the scene. And then I found it. It’s the things that my life in Pakistan has in common with my life in Greece that I always find fascinating. This time of year is also kite season in my home country. But there, kite flying is nothing short of a blood sport. People actually lose their lives over it, falling off rooftops as they try to keep their kite in the air or fatally electrocuting themselves as they try to retrieve their precious kites from power cables. First, children will swap tips on who is making the best kites at the moment, what the best design is and other little quirks like whether a tail helps or hinders flight. They’ll then either make their own by building frames from bamboo reeds stolen from their mothers’ brooms, or venture into the bazaar to pick up a prize kite. Our kites seem very delicate and they are certainly much lighter than Greek kites, but they’re very tough. Next, they will purchase the best type of kite string they can get, and this is where things get truly psychotic. Around this time of year a few decades ago, I could be found with my sisters and friends wandering the streets and back alleys of my neighbourhood looking for broken glass. The more unhygienic and dangerous the source, the better. We’d collect up these broken piece of glass and sit on a step pounding them into powder with a brick. This clandestine activity was usually done in a place where our parents couldn’t see us, and you’ll soon understand why. The glass powder was then mixed with glue and applied along the length of the kite string to make a razor sharp string called manja. Two friends standing at a distance holding the loops of string taut are particularly good for this, as are appropriately spaced trees or street lights. Having been turned from harmless kite string into a dangerous piece of equipment, we’d leave the string to dry before winding it up into innocent looking spools. That’s what I realized was wrong with the image when I stared up into the sky on my first Greek Clean Monday. I wasn’t used to seeing kites flying like this in peace, dancing on the breeze without another kite moving in like a stealth bomber to assassinate it. The point of the glass powder coating, you see, is to turn the kite string into a razor sharp cutting implement. My childhood kite memories are filled with furious kite battles, defeated kites sailing to the ground, teams of scouts checking in our garden for their prize and fingers sliced to ribbons from handling the glassy kite strings. Whereas in Greece a session of kite flying might generate some disappoint at the most when your kite won’t take off or gets stuck in a tree, in Pakistan we’d bite our lips in pain as the wind carried our kites up and away, taking the string with it which would merrily slice across our fingers. Later that day, we’d sheepishly reveal our war wounds to our irate mothers – fingers and hands criss-crossed with cuts of all types where the glass string had got the better of us. This was not what Mary Poppins meant when she sang “Let’s go Fly a Kite”. Flying a kite is supposed to be a relaxing activity. It must be nice for a child to see their kite suspended mid-air without constantly worrying if the kite next to it is going to move in for the kill. In witnessing the true childhood pastime of kite flying without the rivalry, the bloodshed and the vendettas, I finally see what she meant. 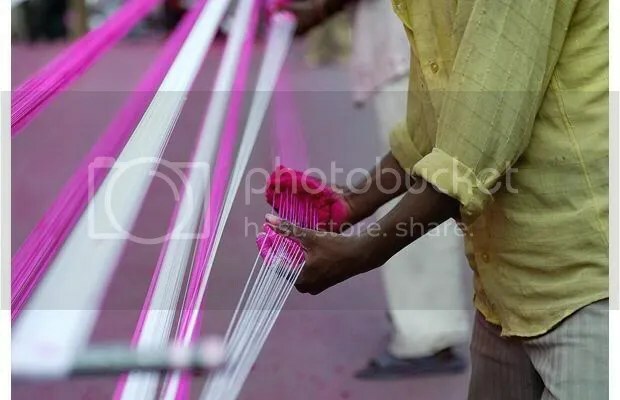 But it did also make me miss the madness and chaos of a Pakistani kite flying season, and the way in which my childhood self’s dreams lived and died on stealing enough bamboo slivers from the broom to make kite frames, and how finely we could grind pieces of broken glass for the string.